Halloween spending is expected to reach $9 billion according to an annual survey by the National Retail Federation (NRF). For those torn between a love of Halloween and being eco-friendly, there are many ways to turn Halloween from orange to green. 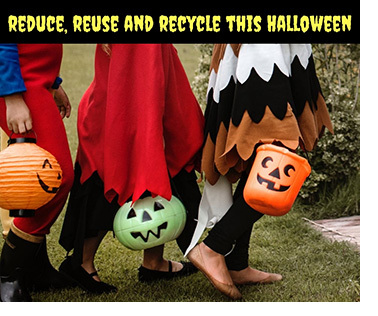 One of the easiest ways to reuse and reduce landfill waste, as well as expenses, is by recycling or upcycling Halloween costumes. Costumes are frequently worn only one time so there are great deals to be had at thrift stores, garage sales or costume exchanges (a favorite on college campuses). Also check with family, friends and neighbors to see if they have costumes you can borrow. The next stop for a greener Halloween is decorations. Like costumes, be on the lookout year round for decorations at thrift stores or garage sales. Decorations can be reused for many years. To keep homes lit up and safe for trick-or-treaters, invest in eco-friendly solar powered yard stakes or LED stringed lights. LED tea lights can be used for lighting jack-o-lanterns or paper lanterns/luminaries on your property or street if your neighborhood participates. If your Halloween decorating includes paper lanterns, choose bags made from recycled content and ones that can be recycled. Inhabitat.com gives ideas for 10 sustainable Halloween decorations for your green home. Homemade decorations are fun to make with kids. Save plastic milk jugs and turn them into milk jug ghosts for your porch, walkway or yard. Simply draw Halloween faces with a permanent marker or Sharpie on one side and on the other side, cut a hole, fill the milk jugs with rocks to give them weight and add a few LED tea lights. When Halloween is over, empty the jugs and throw them into your recycling bin! Candy is at the core of Halloween. You can make sustainable purchasing decisions event when it comes to choosing Halloween candy. Choose candy that is Union Made in America. It’s hard for anyone to resist eating candy while trick-or-treating, but don’t throw wrappers on the ground. Respect the Earth and keep wrappers in a bag or pocket until they can be disposed of properly and remember wrappers are not recyclable. Trick-or-treating in your own neighborhood in lieu of driving somewhere reduces your carbon footprint. Come November, don’t throw your pumpkins in the trash! When carving pumpkins, use every part of the pumpkin. Roast the seeds and turn the flesh into puree that can be used for countless recipes. Not a fan of pumpkin seeds? Put them in a birdfeeder and do some birdwatching. After the pumpkin has been used, throw it in the compost bin or if you live in a wooded area, leave it in the yard, far away from the house, for deer to eat. Many municipalities even offer pumpkin recycling/composting programs. Make it an eco-friendly holiday, and pledge to reduce, reuse and recycle this Halloween.